These monetary maneuvers by the Chinese government surely presage a revaluation of the Yuan dollar peg. It will now obviously benefit China by somewhat cooling things off internally and allowing them more time to place their huge US dollar pool. This should actually happen very quickly. 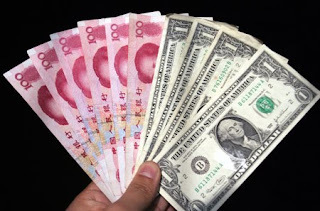 The Chinese are also diversifying their currency holdings but there is only so much that can be done quickly. Again the next two years will be used to perfect this new policy. The USA is still getting its fiscal house in order in a process that if not accelerated by government action, promises to last a decade. So we can expect a slow delinking of the Yuan into a basket of currencies and a step by step advance in the value of the Yuan for at least ten years. We may be impatient with them but recall this is about 1.3 billion people transitioning into a middle class consumer society and they are trying to bring the whole country along. So far they are doing fantastic and have avoided hillside slums that is common most other places. Alan Ruskin, who heads foreign exchange strategy at RBS Securities, notes there is more evidence of a strengthening U.S. dollar than there is to indicating a weakening in the currency. "The dollar's rallied quite sharply. There's a sense that as the U.S. economy is recovering it's hard to conceive of a dollar collapse," he said. Ruskin said he sees China's recent moves to scale back bank lending as a sign the country could move toward using exchange policies as another tool to tighten monetary policy and fight inflation. International pressure for the yuan to rise is growing; there are strong expectations for yuan appreciation. Zhong said expectations for a stronger yuan were one of the factors that could weigh on China's exports in 2010, in addition to uncertainties about global economic recovery and trade disputes. These semi-official comments from a Chinese Minister could indicate that China will move earlier than this summer to begin re-appreciating the yuan versus the US dollar. It could also signal an increased likelihood of something in the range of 10% one off appreciation. The 23% surge in China's foreign reserves last year to $2.4 trillion is a much clearer signal that its currency is undervalued. China rightly worries that a new program of gradual appreciation would only encourage more hot money inflows. So the alternative is to do it all in one bang. To be sure, a one-off sharp revaluation would strike a major blow at China's export base and induce a significant slowdown in the economy. But since China's competitors would enjoy an exchange rate windfall, contagion would be limited. Either way, doing nothing and so indefinitely postponing a more violent, involuntary bursting of the bubble is the worst option. I have posted extensively on what we call dawn age reptiles. These are critters that are at home in swamps and deep water and are mostly aquatic. I avoided talking about the later reptiles for the nonce. The niche occupied by dawn age reptiles immediately solved a huge problem of temperature control. They lived almost exclusively in water and avoided the whole issue. Even our old friend Nessie fitted nicely into the oceanic version of this niche. However, the minute we allow these critters to stray away from water, it is necessary to think about temperature control. Exposed skin does a poor job of controlling temperature. We do not go out and work naked in either the mid day sun or the dead of winter without serious consequences. Every critter exploiting a wider range of temperature using any vigor must be insulated. Basking is not an activity. This has meant hair or feathers. Not surprisingly, these late reptiles are showing signs of using feathers. This probably thinned out as they became large. The internal mass by itself would then be largely sufficient. Down and feathers would be necessary for the young in any case. I think that the default mode for active advanced reptiles included down and feathers as a pre condition to leaving the swamps. I think this story is only beginning to be told. A meat-eating dinosaur called Sinosauropteryx likely sported a rim of colored feathers on its head, down its back and tail when it lived some 120 million years ago. The tail probably had a striped pattern of orange and white. Credit: © Chuang Zhao and Lida Xing. Our image of what dinosaurs looked like has just been colorized, thanks to fossilized feather remains showing one meat-eating beast sported a striped tail of white and gingery bands. Not only do the results paint a jazzier picture of the ancient giants, they also confirm the presence of real feathers, not just "feather-like" or bristly structures, in some meat-eating dinosaurs called theropods, the scientists say. The finding has implications for understanding the origin of feathers, since scientists think birds evolved from a group of theropods called maniraptors, some 150 million years ago during the Jurassic period. "Our research provides extraordinary insights into the origin of feathers," said Mike Benton, a professor of paleontology at the University of Bristol. "In particular, it helps to resolve a long-standing debate about the original function of feathers — whether they were used for flight, insulation, or display. We now know that feathers came before wings, so feathers did not originate as flight structures." Rather, feathers were likely used for color display at first, he added. Specifically, Benton and his colleagues found remains of melanosomes, which are tiny structures enclosing pigments that are embedded within the structure of feathers. Melanosomes are responsible, in part, for the colors exhibited by the feathers of some modern-day birds, such as zebra finch feathers. The team looked at melanosomes from remains of theropods and primitive birds using a scanning electron microscope, finding melanosomes for reddish-brown to yellow pigment and those for black-grey pigment. While the remains didn't include actual pigments, the researchers matched the shapes of these melanosomes with those found in the feathers of today's birds to figure out the color. The pattern of the melanosome structures suggested the theropod Sinosauropteryx had simple bristles with alternating white and ginger, or chestnut-colored rings down its tail. And the early bird Confuciusornis had patches of white, black and orange-brown coloring on parts of its body. "There's a very clear rim of feathers running down the top of the head kind of like a Mohican [Native American headdress] all the way down the back and along the tail," Benton said, referring to feathers on Sinosauropteryx, which lived some 120 million years ago. In the past, some have suggested that what scientists assumed were fossilized feathers were actually bits of tissue. "These bristles really are feathers," Benton said during a press briefing yesterday on the discovery. "If they were bits of skin or connective tissue or something else they would not contain melanosomes." I find this a good discussion on the need for an aggressive government program to expand and also rationalize energy production and transmission. Beyond that I want to repeat a couple of comments of mine on the subject. The first item is that most of the various issues disappear the moment we have some energy storage put in place. For starters, Calcium hydride with thermal solar is a natural industrial grade energy storage system that could easily be used instead of having a power plant on standby for fifty hours of usage per year. The second issue is that the advent of the true electric car is imminent in some form or the other. Each car becomes an energy storage device in its own right. However the demand for all forms of energy production can be expected to sky rocket. The USA should be gearing up to provide loan guarantees and sales contracts to accommodate this rapid build out that will compare to the headlong expansion taking place in China. We could use three years of that. The absolute best policy that the USA and Canada can enact is fund an aggressive replacement of all imported non North American oil. We have more than enough internally if we swiftly displace transportation energy into electricity. We will likely become net exporters of oil once we fully transition to wind, solar and geothermal through a national grid. This is a huge job and a massive retooling of the North American economy comparable to declaring war and going to full mobilization. Yet it is all naturally pays out through internal cash flow. The great hope for powering a sustainable world is renewable energy. The great barrier to powering a sustainable world is the cost and complexity of building a new national transmission grid that will transmit the carbon-free electricity generated by remote wind farms and solar power plants to population centers. In 2008, the U.S. Department of Energy released a report that concluded the United States could obtain 20 percent of its electricity from wind power by 2030. This week the Energy Department’s National Renewable Energy Laboratory issued a study that shows how the eastern half of the U.S. could obtain as much as 30 percent of its electricity from wind by 2024. The study focused on what transmission geeks call the Eastern Interconnection, six linked regional power grids that run from the Great Plains to the Eastern Seaboard and from the Canadian border to the tip of Florida. Essentially, all we need to do is come up with at least $93 billion for new power lines and infrastructure and get myriad transmission operators and local agencies to cooperate on the design of a new high-voltage grid. Sounds daunting. But let’s put the numbers in context. The $93 billion is roughly what the U.S. spends in eight months on the Iraq and Afghanistan wars. Or to use another metric, a little more than what Joe Taxpayer forked over to bail out AIG. The payback to build a transmission grid, however, is likely to be far more productive. Such an expansion of transmission capacity (and the resulting increase ) in wind power—and one assumes, other renewable energy—would displace coal-fired power plants, according to the NREL. It would also solve one of the biggest problems with wind—its intermittency, which plays havoc with keeping electricity flowing smoothly. To greatly simplify, the wind is usually blowing somewhere. By multiplying the number of wind farms that feed into a single transmission grid from a broad swath of the country, transmission operators can rely less on fossil fuel power plants—read coal—as a backup when the wind dies, say, in South Dakota. That will lower not only the price of renewable energy but utilities’ capital costs, which are, of course, passed on to their customers. In California, for instance, utilities like PG&E spend billions on natural gas-fired power plants in order to provide emergency power for those few days each year when the grid is overloaded—hot summer afternoons when everyone cranks up their air conditioners at the same time. Left unsaid in the NREL report is that the massive expansion of wind power needed to supply 20 to 30 percent of the nation’s electricity would be a green jobs machine. At the beginning of 2009, according to the report, the U.S. had 25,000 megawatts of wind capacity installed and added another 4,500 megawatts during the first half of that year, despite the recession. To reach the 20 percent target, NREL estimates that 225,000 megawatts of new wind capacity must come online. Add another 105,000 megawatts to hit 30 percent. The researchers offered different scenarios on how to achieve those goals, relying on varying mixes of wind from the Great Plains, the East and offshore. The 30 percent target relies heavily on developing wind farms off the East Coast, a capital-intensive undertaking that so far has run into huge political problems. The NREL report, which was prepared by the consulting firm EnerNex, offers a highly technical discussion on how to reconfigure the grid to accommodate all that wind. But the bottom line is that between 8,352 and 11,102 miles of 800-volt direct current transmission lines, as well as thousands of miles of lower-voltage power lines, must be built. All in all, as many as 22,697 miles of new transmission lines would need to be installed, along with all the supporting infrastructure. But the key takeaway is that NREL has concluded that there are no overriding technological hurdles or insurmountable financial obstacles to be overcome on the way to achieving the 20 percent target. It is basically a political problem—just imagine the NIMBY nightmare all those power lines would create. Well, a political solution has been offered up by, of all people, Republican pollster Frank Luntz, who previously advised President George W. Bush on how to neutralize demands that the government take action on global warming. Luntz has apparently undergone a climate change conversion. In a poll he released on Thursday, Luntz found that there is broad support among both Republicans and Democrats for climate change legislation when the issue is couched in terms of national security and energy independence. And as green energy advocates press to translate the NREL report into action, it’s worth remembering how a 20th century president managed to persuade Congress to fund a similarly ambitious infrastructure project, the interstate highway system. Eisenhower did not argue that we needed to spend billions of dollars on a vast road system so we could develop the suburbs or drive coast-to-coast with ease. In the fearful fifties, he said building such a transportation network was all about creating the ability to move troops around the country in a national emergency. In other words, a national security argument secured what would become the driver of American prosperity in the coming decades. For the present of course, researchers are discovering how far they can go with this. We know that solar cells can be printed and doing the same with battery tech is an obvious fit. This also suggests that folding can produce larger batteries. Again it is early days for the art itself. The objective most attractive is to store solar energy without moving it at all. That way we avoid unnecessary movement and storage and the related wastage. Having the energy stored for example on the back of a solar panel is clearly most efficient and convenient. That is the promise anyway. I wonder if the ultra capacitor powder can be also printed. This is much more promising and in time it will be more useful if it can be done. As I described in my article on the reverse engineering of an UFO, several layers needed to be laminated together to produce the necessary working shell. One layer been energy storage made good sense but was not necessary. We are presently mastering the necessary arts. A Japanese research group developed a lithium polymer battery that can be manufactured by printing technology. The group is led by Advanced Materials Innovation Center (AMIC) of Mie Industry and Enterprise Support Center (MIESC), a Japan-based incorporated foundation. The sheet-shaped battery is expected to be used with a flexible solar battery or display and to be attached to a curved surface. If the battery is integrated with a solar battery formed on a flexible substrate, it is possible to realize a sheet that can be used both as a power generator and a power storage, AMIC said. Because the battery is made by using printing technology, it can be reduced in thickness, increased in area and laminated. Furthermore, when combined with a roll-to-roll production method, its costs can be reduced, AMIC said. The lithium polymer battery was developed in a research project participated by MIESC, Toppan Printing Co Ltd, Shin-Kobe Electric Machinery Co Ltd, Kureha Elastomer Co Ltd, Kinsei Matec Co Ltd, Meisei Chemical Works Ltd, Mie University, Suzuka National College of Technology and Mie Prefecture Industrial Research Institute. They prototyped two types of batteries. One has an output voltage of about 4V at a room temperature while the other has an output voltage of about 2V. The thickness of the battery is about 500μm, but the battery capacity was not disclosed. 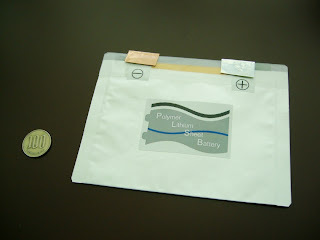 Its negative and positive electrodes were formed on a flexible substrate by using printing technology. This time, the research group used a normal sheet-shaped flexible substrate but employed a printing technology that can be applied to roll-to-roll production, it said. When a roll-to-roll production method is used, the thickness of the flexible substrate can be reduced, enabling to manufacture thin batteries. The group did not use a printing technology to package polymer electrolyte this time. It did not disclose the details of the polymer electrolyte or the negative or positive electrode materials. The research project is a three-year project that will end in March 2011. In the final year, the research group plans to improve manufacturing technologies for commercial production, seek appropriate applications of the battery and set numerical targets such as of battery capacity. This is further confirmation that the decades long sea ice decline is continuing. Field observations describing the collapse of apparent multiyear ice sheets last fall supported that prognosis, but this will tighten it up. This winter I believe we had much colder conditions so if there is to be a halt in the ice loss process, then this summer could show it. That is assuming that the cause of the sea ice loss is significantly related to atmospheric conditions which I no longer subscribe to at all. The little evidence we have supports the idea that a shift in the geometry of the circum polar current cause an increase of surface water flowing into the Arctic. The cycle itself appears to be a full millennia long and is barely understood to exist by myself let alone anyone else. In the meantime, this shows that even badly rotten ice can mask the actual losses. In fact the press has constantly jumped on areal extent as a measure of total ice. It is not. The low of 2007 came about because of exceptional wind conditions. The problem is that the ongoing disintegration of the sea ice has prevented much of a recovery taking place, but normal winds have allowed a more regular area to be covered. We really have doubtful proxies for multiyear ice and it is problematic to just send out parties who can only assess a modest non representative sample. The longer picture is of sea ice decline that has entered its last stages of collapse. As I posted in 2007, I expect it to be glaringly obvious by 2012. Certainly two more years anywhere like the past decade or so will have eliminated the multiyear ice pretty well completely. This year promises to shed significant insight on the role of atmosphere on sea ice loss and perhaps strengthen the case for the global circum polar current paradigm. It would be immeasurably ironic if it could be shown that atmospheric conditions are driven by the variation of sea conditions everywhere rather than blithely assuming that warm weather is the cause of declining ice. That any apparent climate warming or change is mostly reflecting ocean changes we know little about. ScienceDaily (Jan. 23, 2010) — Recent observations show that Beaufort Sea ice was not as it appeared in the summer of 2009. Sea ice cover serves as an indication of climate and has implications for marine and terrestrial ecosystems. In early September 2009, satellite measurements implied that most of the ice in the Beaufort Sea either was thick ice that had been there for multiple years or was thick, first-year ice. However, in situ observations made in September 2009 by Barber et al. show that much of the ice was in fact "rotten" ice -- ice that is thinner, heavily decayed, and structurally weak due to a uniform temperature throughout. The authors suggest that satellite measurements were confused because both types of ice exhibit similar temperature and salinity profiles near their surfaces and a similar amount of open water between flows. The authors note that while an increase in summer minimum ice extent in the past 2 years could give the impression that Arctic ice is recovering, these new results show that multiyear ice in fact is still declining. The results have implications for climate science and marine vessel transport in the Arctic. Authors include David G. Barber, Ryan Galley, Matthew G. Asplin, Kerri-Ann Warner and Mukesh Gupta, Centre for Earth Observation Science, Faculty of Environment, Earth and Resources, University of Manitoba; Roger De Abreu, Canadian Ice Service, Environment Canada; Monika Pućko, Centre for Earth Observation Science, Faculty of Environment, Earth and Resources, University of Manitoba, and Freshwater Institute, Fisheries and Oceans; Simon Prinsenberg, Bedford Institute of Oceanography, Fisheries and Oceans; Stéphane Julien, Laurentian Region, Canadian Coast Guard. Looking for Above Normal Temperatures? They are in the Arctic. Despite the cold air gripping much of the U.S., Europe and Asia, there is a very large area in the Northern Hemisphere where temperatures are well above normal: the Arctic. The National Snow and Ice Data Center (NSIDC) reported yesterday (5 January 2010) that "average air temperatures over the Arctic Ocean were much higher than normal" during December 2009. The extraordinary atmospheric conditions may be tied to climate change and to the rapid decline in Arctic sea ice, as well as other factors that cause climate to vary. In our 24 December 2009 post (Don't be Fooled by Weather's Ups and Downs: The Climate is Warming -- Rapidly ) we explained that the odds of below normal temperatures are lower than they used to be -- but such conditions can still occur. More importantly, we emphasized that it is necessary to look at the big picture -- what is happening globally and over a longer period of time. December is a case in point. While most of us experienced cold conditions and heard in the news only about similar conditions elsewhere in the Northern Hemisphere, vast and sparsely populated regions of the Arctic were well above normal. In Extreme negative phase of the Arctic Oscillation yields a warm Arctic (5 January 2010), the NSIDC included the figure below that dramatically contrasts above normal conditions in the Arctic with below normal temperatures in populated areas to the south. Caption (from NSIDC): Map of air temperature anomalies for December 2009, at the 925 millibar level (roughly 1,000 meters [3,000 feet] above the surface) for the region north of 30 degrees N, shows warmer than usual temperatures over the Arctic Ocean and cooler than normal temperatures over central Eurasia, the United States and southwestern Canada. Areas in orange and red correspond to strong positive (warm) anomalies. Areas in blue and purple correspond to negative (cool) anomalies. Beyond giving us a more complete picture of temperatures in the Northern Hemisphere, there are other reasons why Arctic conditions matter. They not only affect the region's wildlife, ecosystems and communities, they have consequences that spill beyond the Arctic into the rest of the northern hemisphere -- and the entire planet. We explore many of these connections inArctic Climate Feedbacks: Global Implications (PDF, 10.3MB). Atmospheric pressure conditions in the Arctic have a lot to do with the temperature anomalies we are seeing. The atmospheric pressure in the Arctic and its relationship to mid-latitude pressure can fluctuate in a pattern known as the Arctic Oscillation (AO) and its status is quantified as an index value. When pressures are higher than normal in the Arctic and lower than normal in mid-latitudes, the AO is in its negative phase and the index is negative. The NSIDC reports that December's AO index value was -3.41, "the most negative value since at least 1950." There is mounting evidence that atmospheric pressure patterns are changing in mid-latitudes and in the Arctic, that atmospheric circulation -- the large scale movement of air -- is changing, and that these changes are related to the rapid buildup of greenhouse gases in the atmosphere and to the associated decline in Arctic sea ice. While some are using the recent frigid conditions in the U.S. and other regions to raise doubts about climate change science, a wider perspective instead reinforces the science and the need to seriously address climate change by reducing emissions and preparing for the impacts that are increasingly evident. "What we've been observing over and over again in recent years is exceptionally strong ridges of high pressure, sometimes accompanied by strong, persistent "cutoff lows" (upper-level lows cut off from the main jet stream) to the south of the ridges. The upshot: many weather events/patterns in recent years which have been topsy-turvy and/or produced precipitation extremes and temperature anomalies." Ostro concludes that "[w]hile it's important to consider what may happen in 50 or 100 or 200 years, and debate what should be done about that via H.R. 2454 or other measures, we need to get a grip on what's happening *now*." (Ostro's emphasis). · How Did this Happen? Blame the North Pole and the Equator. Capital Weather Gang (Washington Post), 21 Dec 2009. · Where on Earth is it Unusually Warm? Greenland and the Arctic Ocean, which is Full of Rotten Ice. Climate Progress, 6 January 2010. · It's cold outside. What happened to global warming? Christian Science Monitor, 7 January 2010). · Winter Temperatures and the Arctic Oscillation. NASA Earth Observatory, 9 January 2010. 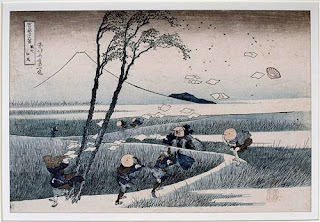 · Feeling That Cold Wind? Here’s Why. New York Times, 9 January 2010. · Frozen In France? Thank The Arctic Oscillation. National Public Radio, 16 January 2010. · It's Cold so There is No Global Warming. Video "Climate Denial Crock of the Week" by Peter Sinclair, 16 January 2010. Adam Sharp makes the most telling comment when he asks if you would rather have the us investment in AIG or the developing equivalent investment in China’s high speed rail network been built to serve over a billion people. That is what makes merely looking at the numbers such folly. China’s growth surge will not truly end until China’s economic demographics match that of the western world and by that standard they have plenty more to do. There will still be shake outs along the way, but the objective is clear and attainable. The true bubble will only burst when they get there and they have to manufacture a system driven by creative growth as finally occurred in Japan. We should have learned by now that sustainable growth is simply a matter of finance when all you have to do is repeat what succeeded elsewhere. Ideology and elitist greed held back global development everywhere while the West recovered from the Second World War yet proved their economic case for economic development. Today, almost everyone has taken the lesson to heart and is applying its lessons successfully. Even the lesson that a globally integrated economy makes war rather difficult has been accepted in strange places. It isn’t all working yet, but it is now a majority position and that certainly was not the world I grew up in. China is still a growth machine, averaging around 9% GDP lately. But a growing chorus of bears thinks they're cooking the books, and that the whole thing is a huge bubble waiting to pop. Jim Chanos is probably the best-known China Bear out there. He's one of the few guys who saw the Enron collapse coming, so people tend to listen to his warnings. He thinks China's economy is only being propped up by massive stimulus spending. He points out that their $900b program represents nearly 1/4 of their $4.3t GDP. China spent billions to build a huge city in the middle of nowhere. It has a huge luxury mall, Venice-like canals, and thousands of empty houses. You can watch an amazing video about the projecthere. Some see this type of project as a clear sell signal. Questions are also being raised about how real China's growth is. For example, official numbers show excellent growth in auto sales. But sales of gas are anemic. Are they fudging the numbers? Chanos suspects they are, and plans to short auto and infrastructure stocks. 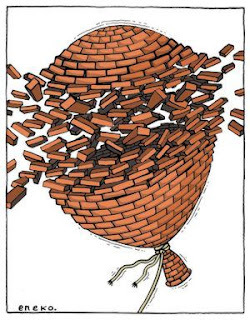 A government-controlled economy will always be full of waste and inefficiency — that's the nature of socialist markets. Bureaucrats generally make awful businessmen. With hardly any stake in the outcome, workers inevitably get careless and make bad decisions. Corruption also tends to creep in. But there are some promising projects taking place in China. And compared to the prospects of developed markets, China is one of the better long-term bets. Jim Rogers is probably the most well-known China Bull. He dismisses talk that China is a bubble. He recently made a not-so subtle dig at Chanos, saying, "I find it interesting that people who couldn't spell China 10 years ago are now experts on China." Rogers thinks that selling Chinese stocks today would be like selling American stocks in 1905. I agree. It might be a bumpy ride, but if I had to put money somewhere for the next 10 years, China'd be near the top of the list. And while some stimulus money is clearly being wasted, some projects look good. One of the more impressive is a $200b high-speed rail network, scheduled to be complete in 10 years. Efficient public transportation is a no-brainer for China. Combine rising energy costs with 1.3 billion citizens in need of transportation, and you have a socialist's dream-project. If well-executed, it'll provide superior transportation and a lower cost of living for hundreds of millions. Now consider the fact that the U.S. has spent around $180b bailing out AIG. 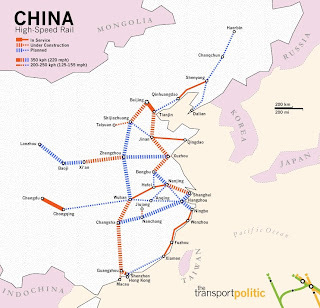 For about the same price, China will have a huge high-speed rail network in 10 years. I doubt our investment in AIG will look so good. The China bull case comes down to growth. Even if they're cooking the books a little to hit their goals, it's still growing faster than 90% of the world. Chinese stocks have historically traded at a premium due to their growth. However, I would probably wait for a pullback to pull the trigger. With the near 100% run Chinese stocks had in 2009, it's prudent to wait at this point. At 30x trailing earnings, Shanghai stocks are priced for extremely strong growth going forward. And the China bears do have some good points, especially the dependence on stimulus spending. That said, if we do get a big pullback, I'll be looking to add to my Chinese ETFs — PGJ in particular. There are a few stocks that are worth a look, but I'm steering clear of the broad-based index funds for now. I recently found a small-cap stock that looks great here. It's China Security & Surveillance Tech, and trades under CSR. It's dirt cheap, trading at a 10x P/E with strong growth prospects.